One minute your girl is a deep space adventurer and the next she's a biologist studying earth worms. 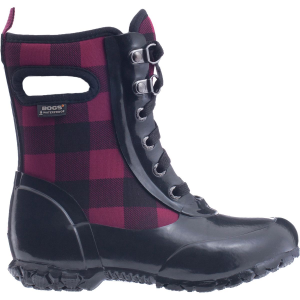 So, keep her imagination running wild with a little help from the Bogs Girls' Sidney Lace Buffalo Plaid Boot. Totally waterproof, these boots will keep her feet dry whether she's splashing through puddles or examining snowflakes. Neo-Tech insulation ensures her toes stay warm on her excursions, while DuraFresh bio-technology fights odors so she doesn't bring stinky feet inside when she stops to record her research notes.